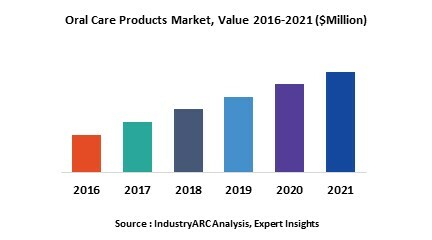 The increasing geriatric population in line with the rising dental caries and several other dental problems are influencing the growth of the oral care products market. By product type, oral care products are classified into toothbrushes, toothpaste, mouthwash, dentures, and dental accessories. Growing spending by people on dental care products and rise in per capita income are also impacting the growth of the oral care products market. The global oral care products market is estimated to grow at a CAGR of 3.1% during the forecast period 2018–2023. APAC is forecast to be the fastest growing market with a CAGR of 3.7%, majorly driven by the Indian and Chinese markets. Due to the rise in aging population, China is expected to witness huge demand for oral care products. In India, rapid lifestyle change and increased awareness about oral health would propel the oral care products market. Oral care products are designed to provide dental care and improve oral hygiene. Oral care products are designed to control several diseases such as gum diseases, tartar, dental decay, and tooth sensitivity. These products help remove plaque, improve oral hygiene, eliminate bad breath causing germs, and also help protect against cavities. According to IndustryARC findings, the toothpaste segment captured the largest market share in 2017 with total revenue of $18,189m. Toothpaste helps in removing the food debris and plaque from the teeth and gum. It is available in various form such as paste, powder, and gel. The Mouthwash/Rinse market is estimated to grow at a CAGR of 5.7% during the forecast period 2018–2023. Mouthwash is a medicated solution used for gargling and rinsing the mouth. A mouthwash may be recommended as an antimicrobial and a topical anti-inflammatory agent. Rising awareness about oral hygiene, dental hygiene and growing incidences of dental caries are fuelling the growth of the oral care products market. The increased spending by consumers on oral care products is driving the oral care products market growth. Furthermore, advancements in technology and development of newer techniques for the manufacture of oral care products are boosting the growth of the market. Stringent regulations are hindering the growth of the oral care products market. For example, in china, there are 10 standards for toothpaste, 16 standards for toothpaste ingredients, 21 standards for inspection, 2 general standards, and 1 labelling standard. The regulatory compliance process involves four main steps, namely formula review, labelling review, functional claiming examination, and custom clearance. Another major challenge for the oral care products market is the product recall. In 2016, The Ministry of Food and Drug Safety recalled 11 toothpaste including Median Fresh Forest, Median Fresh Marin, Median Vital Clean, Median Vital Action and Others which were manufactured by Amorepacific Corporation. The base year of the study is 2017, with forecast done up to 2023. The study presents a thorough analysis of the competitive landscape, taking into account the market shares of the leading companies. It also provides information on unit shipments. These provide the key market participants with the necessary business intelligence and help them understand the future of the Oral Care market. The assessment includes the forecast, an overview of the competitive structure, the market shares of the competitors, as well as the market trends, market demands, market drivers, market challenges, and product analysis. The market drivers and restraints have been assessed to fathom their impact over the forecast period. This report further identifies the key opportunities for growth while also detailing the key challenges and possible threats. The key areas of focus include the types of products in the oral care market, and their specific applications. Types of Oral Care Products: Toothbrushes, Toothpastes, Mouthwash/Rinse, Dentures, Dental accessories/ ancillaries. Some of the other key players mentioned in this report are Dentaid S.L., Johnson & Johnson Services, Inc., GlaxoSmithKline Plc., Colgate-Palmolive Company, and Lion Corporation. In February, 2018, P&G, a key player of oral care products launched a new toothpaste formula Crest which can neutralize harmful plaque bacteria to help prevent gingivitis, even below the gum line. The activated foam seeks out bacteria by penetrating hard to reach places, gently cools gums during and after brushing, and goes around and below the gum line for lasting gum protection. Another oral health care company, Prisyna, launched Moisyn Rinse in September 2018 to treat dry mouth. Dry mouth is a condition where there is a decrease in saliva. It highly impacts the quality of life and causes difficulties in chewing, swallowing and speaking. Moisyn Rinse relieves the symptoms of dry mouth and moisturizes and lubricates oral dryness. 13.3. Johnson & Johnson Services, Inc.